The Legislative Building was formally opened on July 15, 1920, the 50th anniversary of Manitoba’s entry into Confederation. It was designed in 1912 by English architects Frank W. Simon and Henry Boddington III who won a British Empire competition over 66 other entries. The paramount example of Beaux-Arts Classical architecture in the province, the building is sheathed in Manitoba Tyndall limestone and is adorned with many allegorical works of art celebrating wisdom, justice, and courage. The Golden Boy atop the dome is symbolic of Manitoba’s eternal youth and progress. 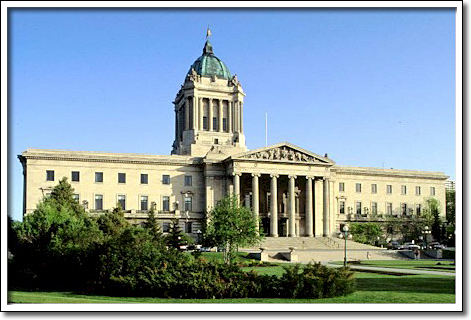 This is Manitoba’s third Legislative Building, built after a period of extraordinary growth and development. The first Legislature occupied the former A.G.B. Bannatyne residence at Main Street and McDermot Avenue until its destruction by fire in 1873. Temporary facilities were used until 1884 when the second building was opened north of Government House. It was demolished in 1920.